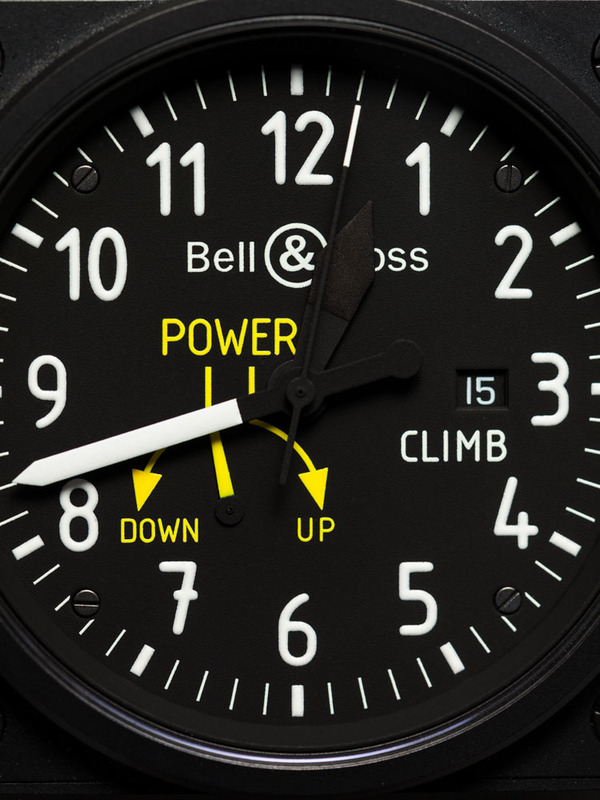 At Basel this year, Bell&Ross added three new watches to their BR 01 Flight Instrument collection, the BR 01 Heading Indicator, the BR 01 Airspeed, and the BR 01 Climb. As with prior examples in the collection, these watches are inspired by electro-mechanical cockpit instrumentation from the Jet Age of the last century. 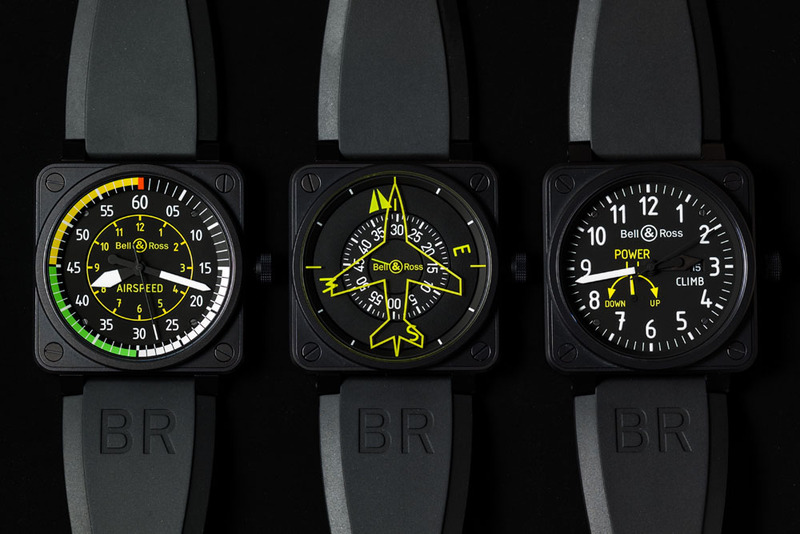 The BR 01 Heading Indicator uses the same disc-based time display that has powered prior watches including the Radar, Compass, and Turn Coordinator. The center disc shows the seconds, the numbered middle disc shows minutes, and the outer compass disc shows hours. In addition to the markings on the discs themselves, the crystal is marked in yellow on the inside surface by the large outline of an aircraft, the 3 and 9 o'clock markings, and the B&R logo. Finally, the inner bezel shows the markings for the hours at the non-cardinal directions. To read the time, the seconds are displayed as a normal. Minutes are read using the yellow marking inside of the aircraft outline, which aligns with the current minute printed in white on the minute disc. Finally, the "bug" which takes the place of the North compass marking shows the hour against the hour markers on the crystal and inner bezel. In the photograph above, the time is 11 hours, 12 minutes, and about 33 seconds. The example below shows 11:20:27. As you can see, the resemblance to the actual instrument is quite good. The Heading Indicator (also called a Directional Gyro or DG) is the primary flight reference for the pilot of where the nose of the aircraft is pointed. 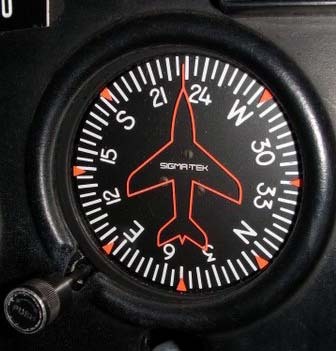 This is separate from the magnetic compass (sometimes called the "wet compass") which is usually located on the top of the "dashboard" or glareshield of the aircraft. The two instruments are used in conjunction with each other, as they compensate for each other's weaknesses. The magnetic compass, of course, aligns itself with magnetic north, and displays the heading to the pilot. However, the magnetic compass is not a good instrument when the aircraft is maneuvering. First, it often leads or lags the actual heading of the aircraft (i.e. moves faster or slower than the aircraft is actually changing heading). Second, the rotation of the compass itself is often "underdamped", which means it takes a few moments for the reading to stabilize once established on a new heading. These characteristics are not good if one is flying by reference to instruments only (for example when in a cloud). The Heading Indicator is a gyroscopic instrument (that is, there is a relatively heavy spinning disc, often driven by engine vacuum, which causes the gyro to want to keep pointing in one direction.) This means the instrument is very sensitive to changes in the aircraft's heading - and thus very accurately shows changes in where the nose is pointed. However, the gyroscope in the basic instrument has no way to know which way magnetic north is, and also has a tendency to drift over time. - When flying straight and level, the Heading Indicator is corrected periodically (e.g. every ten to fifteen minutes) by reference to the magnetic compass. This is done by pressing and turning the knob shown on the lower left of the actual flight instrument. Finally, modern air transports and higher end aircraft have mechanisms to automatically align the heading indication with magnetic north. However, in lower end propeller aircraft, this is still performed manually. 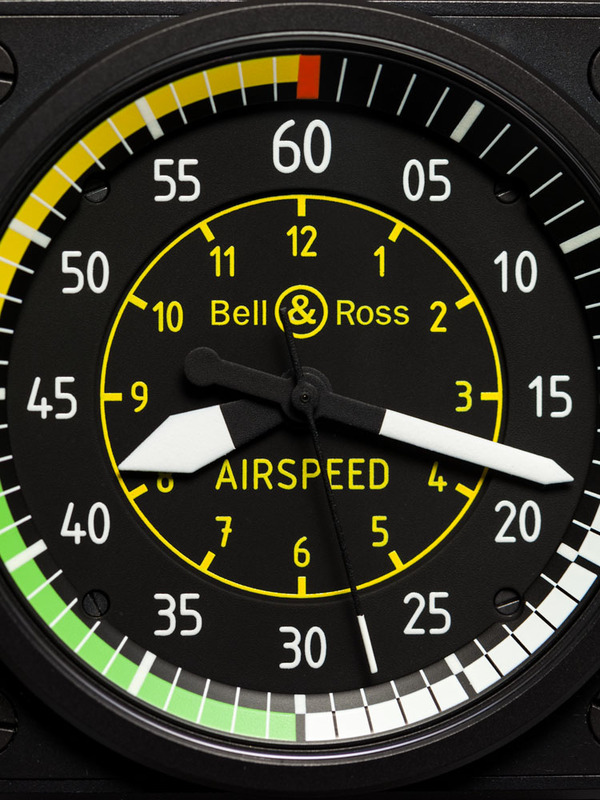 The BR 01 Airspeed indicator shows the time via the usual method; the unique features of the dial include a "B-Uhr" or "Ferguson" layout, with minutes numbered on the outer track, and hours marked on the inner track. Each of the quarter hours are also colored black, white, green, or yellow, with a red marking at the 60 minute mark. 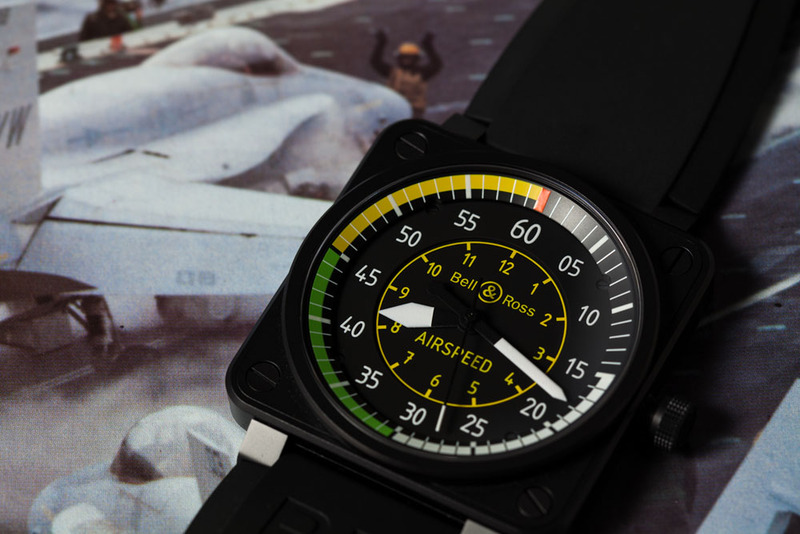 The airspeed indicator, of course, tells the pilot how fast he is traveling through the air, and is the second most important piece of knowledge the pilot needs to know (after aircraft attitude). In its simplest form, it is entirely mechanically driven, by relating speed to the difference between the ambient air pressure and the increased pressure due to motion. This relationship is defined by Bernoulli's principle: Pressure = 1/2 * air density * Speed^2. In this case, it's rewritten to be: Speed = sqrt(Pressure / (1/2 * air density)). Math aside, the colored arcs on the airspeed indicator are matched to the particular aircraft type. The white arc represents the speed range where flaps are usable - the bottom value where the arc ends shows the speed where the aircraft will quit flying (stall) with flaps and gear down, and engine powered back (60 knots in the example above). The top value where the arc ends shows the maximum speed the flaps should be extended (100 knots in the picture). The bottom of the green arc shows the slowest speed at which the aircraft can be flown with the flaps and landing gear up (65 knots in the above example). The yellow arc shows the speed range at which it is fine to fly in smooth air, but is not safe to fly in turbulence (165 knots to about 208 knots in the example). The top end of the green arc, therefore, ends where it is structurally safe to fly the aircraft in rough conditions. Finally, the red mark shows the speed which should never be exceeded (about 208 knots in the example). While advanced air transport and other aircraft have computer generated graphical airspeed displays, some of the colored bands are still reproduced, but dynamically calculated according to the current aircraft configuration. 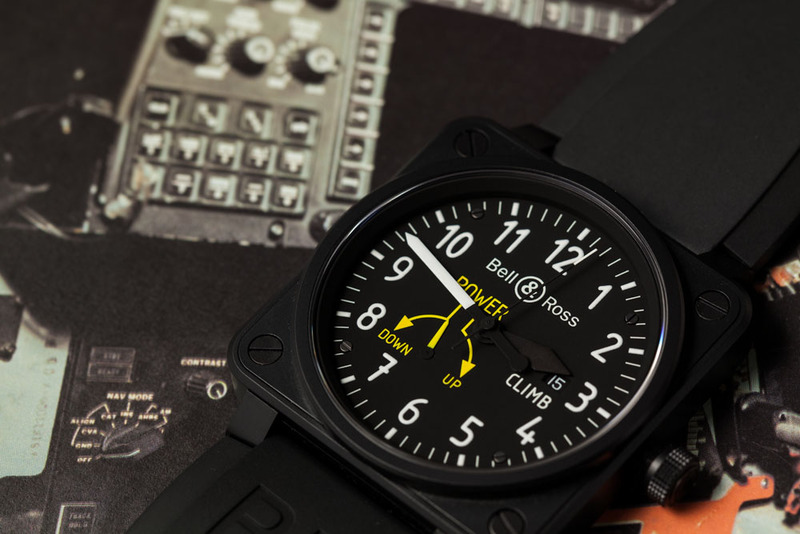 The BR 01 Climb is inspired by an aircraft's Vertical Speed Indicator (VSI). Time is shown using a regular hour, minute, and second hand, with the twist that the hour hand is blacked out (but glows with lume). Also present is an up-down power reserve indicator - a standard feature of the ETA 2897 inside the case. The VSI is an interesting instrument - it measure the vertical speed of the aircraft by measuring the flow in and out of the altimeter. That is, as an aircraft climbs, air leaves the altimeter's chamber because the ambient air pressure is decreasing (with the reverse on descent). 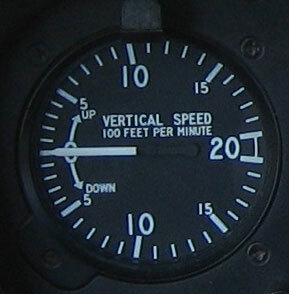 The needle deflects in proportion to the airflow in and out of the altimeter. Unfortunately, trying to measure flow in this manner is a little difficult; the motion of the needle tends to lag the aircraft's movement quite a bit. As a result, for higher performance aircraft, engineers have pulled another trick to help get the needle moving more quickly. In this case, there are some weights mounted on springs, which have the ability to temporarily increase the airflow within the VSI. These weights move in direct response to the movement of the aircraft. 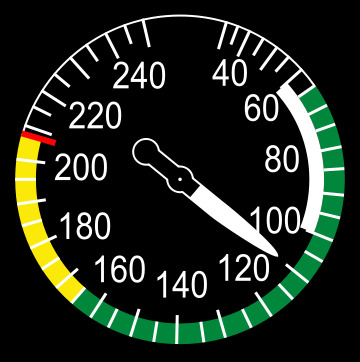 Vertical Speed Indicators which have this mechanism are called Inertial-lead or Instantaneous Vertical Speed Indicators (or IVSIs). Since the instrument has a "zero" value in the middle of the scale, and counts up in both directions, the design of the watch dial is somewhat more abstract compared with the actual instrument. 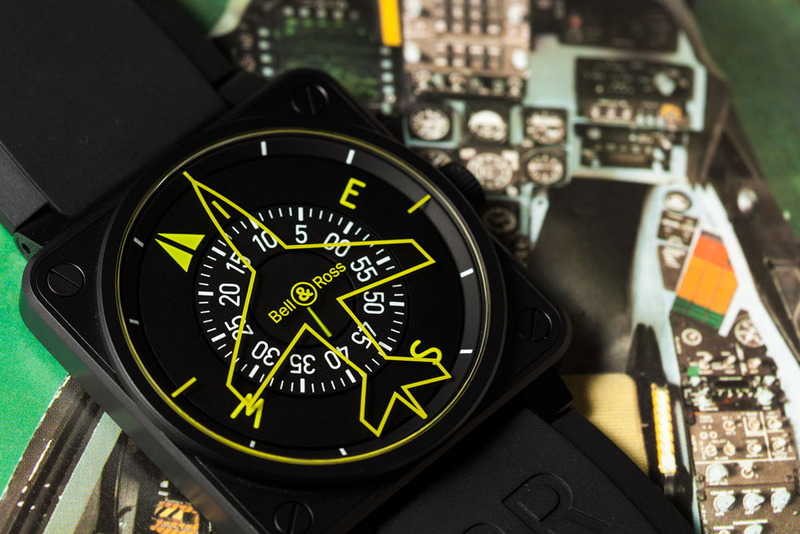 With this set of additions to the BR 01 Flight Instrument collection, Bell&Ross have completed the primary 6 gauges found in the instrument panel of almost all aircraft: Altimeter, Airspeed, Attitude Indicator, Turn Coordinator, Heading Indicator, and Vertical Speed Indicator. 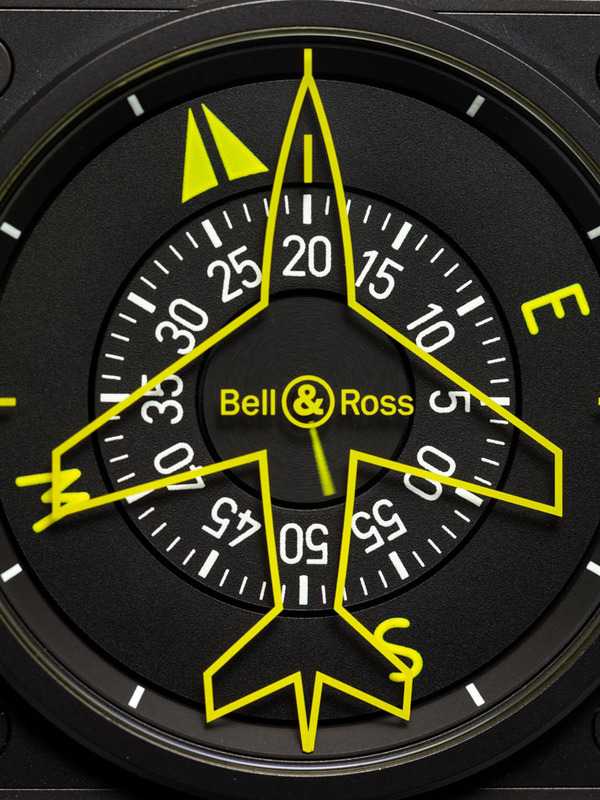 Combined with the Radar and Compass models, Bell&Ross have created a robust set of Flight Instrument inspired watches. In the process, they have created a truly interesting set of timepieces, with a lot of value for collectors. The release of the six watches in a unique edition for Only Watch this year reflects the strong identity B&R have created for themselves. Looking forward...given that there are a whole host of other navigation and engine instruments out there, one can speculate that this line of collectible pieces potentially still has a few iterations left. Thanks to Bell&Ross USA for loan of the watches.